Summertime is well-known for swimming, fresh fruits and vegetables and our favorite form of cooking: grilling. However, if you're not careful with your grilled food, you could turn healthy delicious food into dangerous time bombs. You can grill some of the healthiest foods you can eat. I think this is because you can't grill grains and have to stick with the healthier whole cuts of meat and vegetables. And there is just something about grilling that makes food taste delicious. 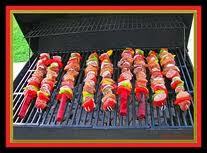 But while there are many health benefits to grilling foods there are a few downsides. That black and charred bit, it contains some of the most potent carcinogens in the world. When meat is cooked at high temperatures, amino acids react with creatine to form heterocyclic amines, which are thought to cause cancer. The good news is that there are ways to avoid that. One of the best ways is also our favorite: marinades. Marinating meat does not allow it to burn and create the heterocyclic amines. Two other great ways to keep your meat healthier are to cook at lower temperatures for a longer time and to eat vegetables with your grilled meat. The last suggestion that often comes up, which very few do, is to microwave your meat before you cook it. You can try bell peppers, onions, eggplant, zucchini, halved plum tomatoes, mushrooms, broccoli, cauliflower, asparagus, potatoes (sliced thin), corn on the cob, garlic, artichoke, squash and hot peppers, Apples, firm peaches and nectarines and pineapple make great grilled desserts. You also need to worry about cooking your meats thoroughly. While vegetables can be eaten raw, most meat needs to be cooked. The final internal temperature, at the very center of the meat should be measured with a thermometer. Clams, Muscles, Shrimp and Scallops should be cooked until they turn opaque. Christina Major is the Naturopathic Doctor and Holistic Nutritionist of Crystal Holistic Health Consulting. Crystal Holistic Health offers nutritional consulting for most health problems including diabetes, cancer, heart disease, weight loss and childhood obesity. Clients receive a full lifestyle interview and personalized nutritional and lifestyle education. Crystal Holistic Health also offers educational seminars and teleseminars on a variety of nutritional topics including eating habits, portion control and most health problems and how eating right can make them better.